The View from a Microbiologist: How E. coli helps us? How E. coli helps us? and the current E. coli O104:H4 strain causing disease in Germany. 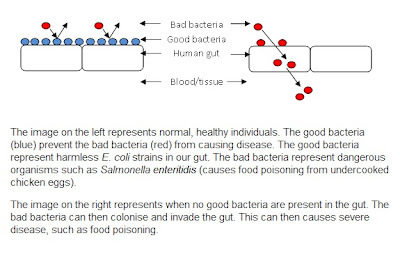 Harmless strains of E. coli colonises the human gut and prevents dangerous organisms from invading and causing disease. If we had no E. coli in our guts then there would be nothing to stop dangerous organisms from invading and causing disease (see image below). 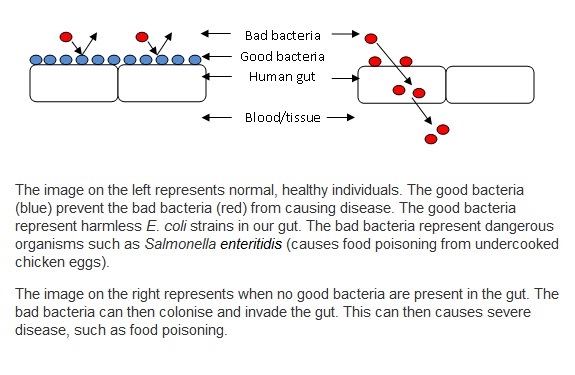 So.. Due to the recent outbreak E. coli has looked like a bit of a ‘bad guy’, but in fact the opposite is true. This bacterium is responsible for keeping our gut healthy and actually preventing us from disease! Like any family... It’s those 4 bad ones that give E. coli a bad name!